08. Perfected On Puritan Ave.
As one of the most-celebrated auteurs of his generation of hip hop artists, Black Milk has conditioned fans and critics to always expect the unexpected each time he releases new music. Few producers have earned the notoriety and respect he has as a musician, and when that is coupled with commanding talent as an emcee, it’s no surprise that his solo releases are met with exalted anticipation. 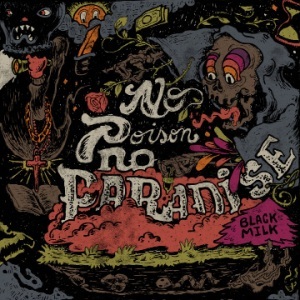 The new full-length album “No Poison No Paradise” continues Black Milk’s trend of releasing material that maintains his signature sound while pushing it into new territory. Musically, each of Black Milk’s releases have kept one foot dipped in classical boom-bap and the other stomping with a fierce originality and willingness to expand his listeners’ sonic palate. “No Poison No Paradise” leaves behind the density and heavily-layered sounds of his 2010 release “Album of the Year” in favor of a more stripped-down approach. Some tracks showcase the raw sample-driven styles that helped make him one of Detroit’s hottest young talents nearly a decade ago. Others flex some of the sophistication and musicality that have helped to make his live show among the most-acclaimed in hip hop. Whichever direction he decides to take it, all of the trademark characteristics of Black’s music are fully apparent throughout the album: hard drums, melodic synths, and nimble flows. Perhaps the most noteworthy aspect of “No Poison No Paradise” is the evolution of Black Milk’s lyrical style. While he’s never been shy to get personal on the mic, Black introduces a refined ability as a storyteller on the new release, mostly told through the dreams of a character named Sonny. The album’s songs are steeped in autobiographical themes and construct rich visceral imagery of everything from the experience of growing up in a rough working-class neighborhood of Detroit to the struggles of maintaining one’s inspiration and success as an artist. Even with his lyrical progression, Black’s rap styles are unquestionably sharper and more varied than ever. “No Poison No Paradise” is another accomplished full-length solo release for Black Milk, and a return to form for one of hip hop’s most versatile talents. The album features guest appearances by Grammy-Award winners Black Thought (The Roots), Robert Glasper, and Dwele, as well as long-time collaborators Will Sessions, Mel, and Ab.